Ma Maison in Ho Chi Minh City, Vietnam, is housed in a 70-year-old colonial villa remodeled to evoke French country life. (Budget Travel) -- We scoured the globe for the 20 best new boutique hotels under $150. You'll meet the owners; you'll kick back on your own private balcony; you'll eat homemade granola each morning; you'll never want to leave. More Palm Springs-chic than Las Vegas-bling, Rumor is a far cry from most Sin City resorts. Just a few blocks off the Strip, the two-story hotel trades the buzz of slot machines for a tranquil palm-and-pool-studded courtyard, complete with hammocks on the lawn and a DJ who spins classic rock on the pool deck. The 150 rooms are all done in Rumor's signature color palette of purple and cream, from the fresh orchids on the desk right down to the lavender-scented bubble bath. rumorvegas.com, from $89. After opening in January, Longman & Eagle became one of Chicago's most sought-after restaurants, known for rich comfort food like house-made pork sausage and ricotta pasta. But it was missing a crucial ingredient: a place to crash after dinner. Last month, Longman's owners solved the issue by unveiling six guest rooms upstairs -- done in the same cozy decor as the pub. longmanandeagle.com, from $75. Pennsylvania Amish country has never lacked appeal -- antiques markets, covered bridges, farm-fresh foods. It was finding an appealing hotel that was hard. No longer. Last spring, the Cork Factory Hotel opened in a 145-year-old redbrick foundry, still equipped with its huge, original glass-paned windows. The 77 rooms are within walking distance of a 120-year-old market, where farmers still hawk their wares every week. corkfactoryhotel.com, from $139 with breakfast. When owners Nana Simopoulos and Caryn Heilman set out to restore a 19th-century brick boardinghouse in the Berkshires, they didn't just strive for eco-conscious design -- it was more like eco-perfection. Nearly everything in the eight-room Topia Inn is organic, from the breakfast of banana bread, spinach quiche and fair-trade coffee to the plush mattresses made of chemical-free cotton. Even the walls are plastered with bright, earth-friendly clay, which makes them cooler in the summer, warmer in the winter and inviting all year long. topiainn.com, from $125. Set on a quiet strip of white sand 35 minutes southwest of Tampa, the Postcard Inn on the Beach is a dose of Florida Keys flair transported to the mainland. Each of the 196 rooms is wallpapered with surfing photos and accented with vintage lamps, while the lobby has its own macramé art installation and colorful surfboards. The effect is an overwhelmingly casual vibe that continues out in the garden, where Adirondack chairs surround a fire pit and the beachfront bar serves blackened tilapia sandwiches and bacon-and-jalapeño-wrapped shrimp -- perfect snacks for Postcard's dive-in movie nights, when surf, travel and classic films are projected above the pool. postcardinn.com, from $99 with breakfast. Long before Cancún or Cabo, Acapulco was the king of Mexican resort towns --and the Hotel Boca Chica was its crown jewel, drawing everyone from Elvis to the Rat Pack. Now, after a three-year remodel, the Boca Chica has regained its former sparkle. The 36 rooms are lacquered white and flooded with light, and all have private balconies. Meanwhile, old Hollywood touches throughout -- like lamps made from conch shells and latticed brickwork -- serve as ever-present reminders of its storied past. designhotels.com/bocachica, from $95. It's one thing to stay in the heart of a Spanish colonial city -- and quite another to stay in a Spanish-colonial mansion. Located smack in the middle of Granada's historic district, the sprawling 19th-century Hotel Spa Granada has five garden courtyards, a lagoon-like swimming pool in the center, and 15 expansive guest rooms (some with ceilings as high as 18 feet) that are decorated with handicrafts from a local artisan. A free spa treatment is included with every night of your stay, but the rates are so shockingly affordable -- a 60-minute massage is $20, an aloe facial is $10 -- that a full day of pampering hardly qualifies as a splurge. hotelspagranada.com, from $49 with breakfast. The 12 cabins at Oxygen Jungle Villas were constructed with a singular goal: to make you feel like you're the only person for miles. Blissfully isolated among barriers of tropical plants and vines, the one-bedroom villas come off like Swiss Family Robinson tree houses. Each has a private sun-deck, a sharply angled roof, and glass walls to maximize views of the Pacific Ocean a mile away. And considering the adults-only hotel never takes more than 24 guests at a time, it's hardly a stretch to believe the jungle is yours and yours alone. oxygenjunglevillas.com, from $139. In a rare example of a marketing gimmick gone right, the Pantone Hotel delivers on the style standard that design geeks have come to expect from the namesake global color guru. Each of the property's seven floors is dedicated to a different hue -- from vivid tangerine to cool sky blue to buttery yellow -- which comes through mostly in accent pieces and artwork. White bedding, walls and window dressings keep the 59 guest rooms in balance. Even the rooftop bar picks up the pigment theme, serving drinks named for the color codes they most closely resemble: Pink Champagne 12-1107, Lemon Drop 12-0736, and Daiquiri Green 12-0435, to name a few. pantonehotel.com, from $89. Cornwall's rugged cliffs, manicured gardens and 300-plus public beaches have drawn British vacationers since the 1800s. Now the seaside retreat, four and a half hours west of London, has one more draw to add to the list: the Nearwater. At this whitewashed B&B in the town of St. Mawes, owners Tim and Amelia Whitaker have transformed a simple home into one of the area's sweetest small hotels. Bamboo floors, Danish teak furniture and a mirror made from driftwood give Nearwater a light, nautical look, while the three rooms' beds are covered in sailor-striped wool blankets. Added to that, Amelia's homemade granola and pancakes are the perfect start to a day spent taking one of Tim's famous guided walks along the coast. nearwaterstmawes.co.uk, from $131 with breakfast. For years, London's members-only clubs catered exclusively to their elite clientele. But in April, the East End's Shoreditch House broke ranks and opened 26 rooms to the masses. While this technically means it's now a hotel, the Shoreditch sure doesn't feel like it: Antique telephones, oak tallboy chests, complimentary umbrellas and bookshelves filled with board games and guidebooks speak to its heritage as a private club. Guests enjoy the same privileges as members, including access to the fourth floor's two-lane bowling alley and the trendy rooftop pool, which has views of the London Bridge. shoreditchhouse.com, from $116 for nonmembers. Imagine arriving in Paris only to have some globe-trotting local hand you the keys to her apartment. That's the idea behind Bohème, a 366-square-foot, one-room hotel in the Montmartre district within walking distance of the Sacré-Coeur Basilica and the boutiques along rue de Clignan-court. The property is one of three apartment-style rentals run by the French boutique hotel firm Bed & Style. The sunlight-drenched space has a teak canopy bed, draped in scarlet curtains, and a daybed made of Indian acacia. In an alcove, visitors will find Bohème's most useful feature: a fully equipped kitchen stocked with Moroccan tableware. bedandstyle.com, sleeps three from $109. Four hours south of Paris, a wilderness of pine forests, crystal-clear lakes and volcanic peaks springs from the countryside. It's the kind of rugged landscape you'd expect in Montana, scattered with wild horses and wolves. Except here, at the Instants d'Absolu Ecolodge & Spa, you can also enjoy French food and creature comforts. Chocolate croissants and wildflower jam are set out each morning, and post-dinner cordials of lemony pine liqueur are served by the outdoor hot tub. Lest visitors get too relaxed, all 12 rooms have exploration-friendly binoculars and boots. ecolodge-france.com, from $115. Part stylish hotel, part traditional hostel, the Mosaic House is an experience all its own. Inside the six-story 1935 building, guests can opt for one of 64 private rooms (from $26) or one of 30 shared spaces -- for nearly half the cost (from $15). While the atmosphere skews toward the casual (think board games and beanbag chairs in the lounge), the decor is more upscale: Each room is done up in chocolate brown, burgundy and gold and is accented with quirky touches like closet rods made of tree branches and tables fashioned from salvaged-wood beams. mosaichouse.com, from $15. Aspiring creative types will feel right at home in the new Art Plus Hotel: Five of Israel's leading artists painted huge nature-inspired murals on the first-floor walls, and there's a video installation running on a loop in the lobby. Concrete floors and stark-white walls serve as a backdrop to eye-popping furniture, like the purple Pantone chairs in the library, where free happy-hour wine, fruit, dips and sandwiches are served amid a collection of art books. All 62 rooms are decked out with king beds backed by metallic-gray vinyl headboards, glass-topped desks and '60s-era armchairs. And if inspiration strikes, each has crayons, watercolors and sketch pads on hand. atlas.co.il, doubles from $120 with breakfast. Before returning to his native Thailand to open La Bhu Salah hotel, chef Vatcharin Bhumichitr perfected his recipes as a restaurateur in London for 20 years (he also wrote 10 popular cookbooks). At the combination hotel and cooking school in the jungle-covered hills north of Chiang Mai, visitors can sample Bhumichitr's unique takes on traditional Thai dishes at the restaurant and then sign up for one of his individual or group classes. Local artisans also lead on-site batik, ceramics and jewelry-making courses, while evenings are filled with folk music concerts and performances of traditional Lanna dancing. La Bhu's 13 rooms are spread across five 2-story wooden houses, each with an open-air art studio on the ground floor. bhusalahchiangmai.com, from $21. Far from the city's high-rises in a 104-year-old shop house, The Bhuthorn channels Bangkok's royal past. The three jasmine-scented rooms are all named for a different Thai prince (the Grand Palace is a five-minute walk away) and filled with treasures from the owners' travels across Southeast Asia: Burmese teak beds, quilts stitched from sarongs, woven rattan chaises. Afternoon tea is served in the leafy courtyard and is usually capped off with an assortment of traditional sweets gathered from family-owned shops in Old Town, the surrounding neighborhood. thebhuthorn.com, from $102 with breakfast. Positioned on a hill overlooking the Mekong River, the year-old BelleRive Boutique Hotel is an ideal base from which to explore Luang Prabang's unique Buddhist and French-colonial influences. The eight light-filled rooms are spread across two buildings -- including a former mayor's residence -- shaded by tamarind and frangipani trees. All rooms come with river views and four-poster rosewood beds draped with elephant-adorned silk runners and enclosed by sheer white curtains that double as mosquito nets. Best touch: Free bikes are on hand for guests to use to discover the town's temples, monasteries, and cafés. thebellerive.com, from $110 with breakfast. The last thing you'd expect to find in Vietnam's hyper-kinetic capital is a tranquil French retreat, but such is the pleasant surprise of Ma Maison. 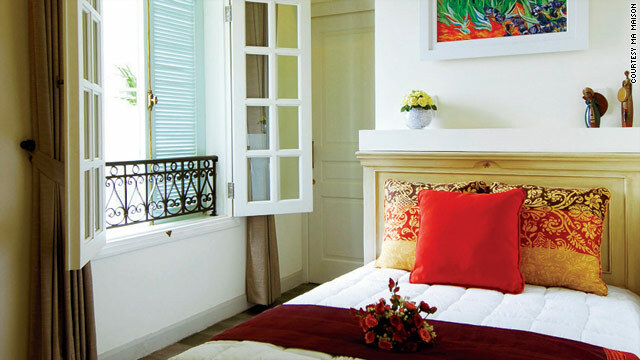 Run by Natasha Long, a Saigon local, the inn is housed in a 70-year-old colonial villa remodeled to evoke French country life. Walls are painted in soft yellows and greens, while the 12 rooms have blond-wood beds and desks with gold-leaf details. The hotel's bistro completes the vibe, with a menu full of French fare such as braised chicken with mushrooms. Add to that thoughtful touches like the complimentary mobile phones with free local service and an affable cat, Mr. Sushi, and you'll be feeling like family in no time. mamaison.vn, from $70 with breakfast. The Sojourn Boutique Villas is the rare resort that soothes your body and soul all at once. The 10 red-and-white bungalows are just a few miles from the iconic temples of Angkor, so guests can spend their days wandering among 12th-century Buddhist ruins and their evenings soaking in the palm-tree-fringed saltwater pool. All that relaxing comes with the peace of mind that Sojourn donates a portion of its proceeds to clean-water initiatives and English lessons for residents of the nearby Treak Village. sojournsiemreap.com, from $100 with breakfast.